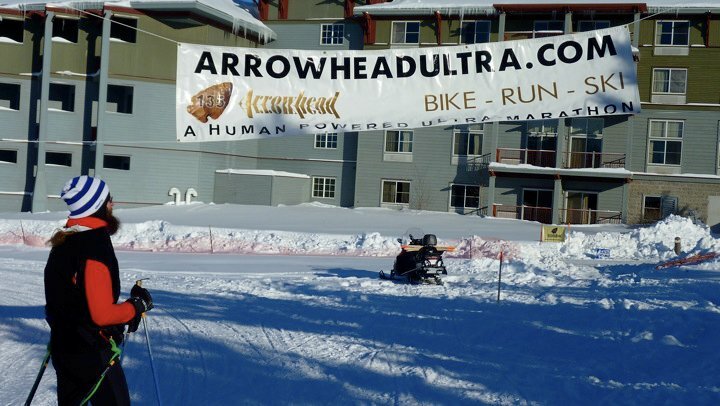 The Arrowhead 135 has been my favorite race now for 6 years. Ever since first biking the race in 2006 I've come back every year. It's an obsession of sorts. But it wouldn't be the obsession that it is if I were coming back to the exact same race every year. I need it to be something different, something new, every time. Now weather provides different in spades up at the Arrowhead 135, cold and colder, snow and snowier, and I should be content with that, but I'm not. 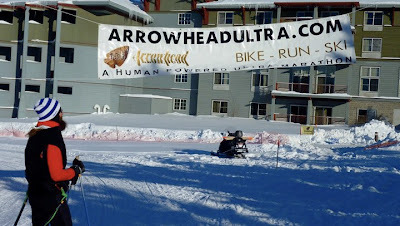 That's why coming in to this year's Arrowhead, the 7th annual, I had biked and skied and now I was running it. Running is too strong a term. Most of us walk as running would be too tiring and too sweaty in the snow and cold. Many of us say we're going to do it "on foot" or something similar. It's the pedestrian class. I was as nervous as I've ever been going into this years race. 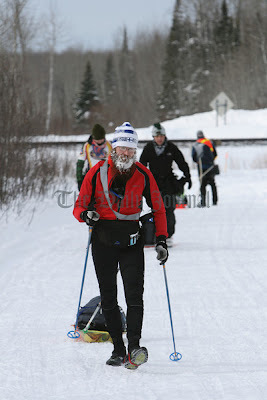 As nervous as last year when I felt I might actually finish on skis. When there's no chance of finishing I'm not nervous. When there's no question of finishing I'm not nervous. This year I knew I had trained as hard as ever (not very hard by most folk's standards) and the goal was within reach, but I wasn't sure. It looked like it was going to be the toughest race I'd ever entered. I was hoping for an easy year. From the start at Kerry Arena I set a good pace. I wouldn't run, but just walk as fast as I felt comfortable. I don't know exactly how fast it was, but I'd guess I was approaching four miles per hour. Temperatures weren't too bad and I wasn't having any trouble keeping warm. Even my feet, which I was a little nervous about since I hadn't tested my footwear in temps colder than -10f, were comfortable. There's not much to say about the first 35 miles of the course. It's pretty flat and easy. The snow was well packed down and even after a groomer went through it was pretty solid. The pack thinned out a lot and it didn't really feel like there were over 100 participants in the race. Just before dark I made it to Gateway, the first checkpoint. I had visions of being in and out quickly so I brought in everything I thought I needed and made all my purchases immediately. Soup, hot dog, Monster energy drink, coffee. I ate, changed my socks (the first pair already had a hole in the heel), used the bathroom, and refilled my Camelbak and bottles. I got in and out about as fast as I could, but I later found out that I spent an hour at the store. It's all too easy to waste time at a warm checkpoint. Back out on the trail I finished my coffee and continued my fast walk pace. So far I hadn't had any troubles with hamstrings or heels, both places I thought might be problems. Time passed and I made it to the Ash River shelter. I stopped in the somewhat hidden shelter and ate a pop-tart and rested my legs for a minute. I was feeling pretty good. As I left I noticed that there was a tent set up just beyond the shelter and they had a nice fire going. I figured it must be some causal "touring" cyclists, but it turned out to be the folks from EWS, the skipulk people. They had hot chocolate and if I had known it I could have rested in the tent, but it's probably for the best that I didn't know. I had been plenty comfortable in the shelter without heat. After downing a cup of hot chocolate I was on my way. I had another nine miles to my stopping point for the night, Black Duck shelter. There were only a few people camped out at Black Duck. Fewer than in previous years. I could see Mike Stattelman's skis and a Salsa Mukluk leaned up against the shelter. The cyclist was sleeping inside the shelter and I figured there was room for one more. I used just my sleeping bag and pad and skipped the bivy sack. Unfortunately I had forgotten a pee bottle and knew I'd be getting up a few times in the night. Taking off my shoes would be a bit of a chore in the cold conditions so I merely stuck my feet into the sleeping bag's stuff sack rather than unlace them. I slept pretty well, all things considered, and only had some minor problems with chilly feet. I heard Mike get up to leave and Lisa Paulos catch up and pass me, but I reasoned, it's a long race and I needed my rest. After my third time getting up to pee it was time to go. I had slept about three hours. The cyclist was still snoring away. The first thing I noticed after getting moving was that it was cold. I know I'm good to at least -20f with what I was wearing and so it had to be colder than that. I wouldn't find out until I arrived at Melgeorge's that it hit -35f that night. I put on my down jacket and army surplus over-mitts, both of which I had never used in anger before. In fact I had almost ditched the mittens at the last minute, I'm glad I didn't. My pace was still good though I was starting to get a twinge from my right hamstring. I passed several runners just after the shelter and I was glad to have slept. I find that if I sleep for a few hours I can make better time on the first night than if I go straight through. Passing those runners only confirmed it. By the time the sun came out I was through the worst of the hills and only had a few miles left to Melgeorge's. I was still suffering from cold hands however. Every so often I would have to stop using my poles and make fists to warm my numb fingers. My fingers always came through though so it wasn't too bad. I caught up with Mike Stattelman and Lisa Paulos on Elephant lake, just before Melgeorge's. Mike had carried his skis at least half the distance from Gateway. It was just too cold to get any glide. I know how awful it is for me to walk any distance in ski boots and figured he was done. Lisa was suffering from cold hands too and from chatting with her I could tell the long night and cold had taken a lot out of her. I was hoping she'd recover and keep going, but it wasn't to be. I was relieved to be at Melgeorge's and glad to know I was halfway done. I stripped off my outer layers, shoes and socks. I had one blister on my right heel, but nothing too worrying. My feet were a little swollen and starting to get leathery. Nothing to worry about as I've been there before. I greedily ate some soup and a grilled cheese then went up to the loft for a nap. I didn't want to sleep long, but any time I could rest in a warm place I felt I had to take advantage of it. It couldn't have been longer than twenty minutes or so and I decided it was time to get going. I changed socks, refilled my water and restocked my food from my drop bag. I had, as usual, massively overestimated how much I would eat, but better that than underestimating. Figuring that if it had hit -35f during the night it wouldn't be all that warm during the day I dressed for sub zero conditions and headed out the door. Mike, to my surprise, was heading out as well. I figured he'd catch and pass me during the warmer daytime conditions, but it never did warm up enough for efficient skating. He dropped out at Crescent just before the cutoff. I had spent about two hours at Melgeorge's and that seemed about right. Rest had again done me good and I was once again truckin'. Speaking of truckin', this was the first time during the race that the image of Mr. Natural truckin' came to me and it was to help/haunt me to the finish. After Elephant Lake there are a few huge hills and then quite a few miles of flat. I formed a paceline with Carles Conil and another runner whose name escapes me. Somewhere near the Elephant Lake access road I spotted something crossing the trail ahead of us. It looked like two large black dogs with white tails. Wolves? I had been noticing recent tracks in the trail since before Gateway, but this was the first I had seen anything. I alerted the others, but they hadn't seen anything and the wolves were gone. Perhaps it was just snow in the trees. I hope not. Shortly after crossing the road Carles and the other runner picked up the pace and I couldn't hang with them. My hamstring was getting worse. Still, I didn't take many breaks and I overtook Carles a few times before we arrived at Myrtle Lake shelter. I sat down inside the shelter just to be "inside" for a while. It seemed warm with the sun shining on me and ate a pop-tart. Carles sat down outside and Marcio Villar caught up to us. Marcio shared some peanut butter crackers with us and we moved on. It seemed all too soon and the sun was setting again. I geared up for another cold night, and put over-sized wool socks over my shoes then fixed them in place with Yaktrax. I also put on my down jacket and army mitts. Soon though my hands were getting cold and numb. It was a lot colder than I had expected. I started to panic a little bit. Luckily, Lynn Saari, who had dropped out, had talked me into taking a couple of chemical hand warmers at Melgeorge's. Now I was glad to have them. I opened them up and dropped them into my over-mitts and after a few minutes of faster paced walking I felt much better. Disaster averted. I had forgotten just how many rolling hills there are in the second half of the course. I kept hoping to spot the Elbow Lake shelter, but it wasn't showing up. I was starting to hope that I had missed it, but I knew it wasn't possible. There are several distinctive landmarks, a trail junction and a bridge, just after it and I hadn't passed those. Now nothing was tasting right and I was starting to tire. I was getting a cotton mouth sort of feeling and I think I had slightly frostbitten the inside of my mouth with all the frozen food I was eating. Even though nothing tasted good, my stomach and my mind were both telling me to eat more and so I did. Finally I arrived at the shelter. I hear that this is a very pretty place with a nice view of the lake, but I've never taken advantage of it. In '06 I didn't even see it on the bike and in '10 and this year it was dark and I didn't have time to stop. Carles was there though, just getting up from a nap. He mentioned that his favorite part of camping is just getting all the gear out. I wish I could have agreed, but when I get the gear out all I can seem to think about is how hard it will be to put it all away again. I kept moving and passed Marcio who was just settling down for a nap beside the trail. I asked him how he was doing and he said he was tired and cold. He asked whether or not he should take off his shoes before putting his feet inside the sleeping bag. I shrugged and said it didn't matter. If we had shared a common language I could have told him what I had done earlier with the stuff sack, but it seemed too hard to try to communicate that to him. Finally I was into the real hills. Up and down without a break. My hamstring ached on the uphills and my knee ached on the downhills. I was feeling okay, but I had to use my walking poles like crutches to climb every slope. I realized I was slowing down a lot and knew it was time for a rest. I started looking for a place to lay out my sleeping bag, but I was a little picky. I wanted a spot packed down by a snowmobile, but off trail, and on top of a hill. I figured that'd be the warmest spot on this cold night. I kept saying to myself that I'd find it on the next hill and so several hills later I found something like what I wanted. A snowmobile had pulled off the trail, but the spot was very unevenly packed down. Some spots were hard as rock and some very soft. I kicked at the snow to even it out a little, but I didn't try very hard. I set out my walking poles to mark the spot, laid out my pad and bag, then used my sled to block the entrance to my campsite. I didn't want any snowmobiliers running me over. I lay down at an angle somewhat like a recliner chair, but with a hole to my right that I'd roll into if I wasn't careful. It should have been uncomfortable, but I fell right to sleep. I woke myself up a few times snoring and found that I had rolled into that hole, but I didn't mind. I was warm and sleep felt great. After the third or fourth time waking up at the sound of my own snoring I decided, once again, that this was a race and I'd better get moving. I had slept for about an hour. As I was packing up Carles came up the hill looking good and passed me once again. Marcio was just behind him, but moving slowly and not looking so good. I asked if he was okay and he responded, "muito frio." I know that much Portugese and asked him, as best I could, if he needed anything and suggested he try getting in his sleeping bag. "No. Drop. Snowmobile." he responded and I told him if I saw any snowmobiles I'd send them to him. It was cold, and I had to pull my hands into fists around the heaters in my mittens from time to time. I could only do that on flat spots however as I still needed the poles to walk up and down hills. There were no flat spots. It was all hills. Marcio caught up with me some time later. At first I figured I must be really slowing down, but I asked him how he was doing and he responded, "Maravilha," which I took to mean, "It's a miracle." He was warm once again and feeling strong. I'm glad no snowmobiles had passed us during that time. We must be getting close to Wakemup hill (the last one), I thought. I started looking for it around every bend in the trail. I caught up with one runner who was melting snow for water. He had run out. I was thankful that I had increased my water load from 3 liters to 4 at the last minute. By insulating the water bottles with my sleeping pad I was able to keep them from freezing even in the cold temperatures we were experiencing. Marcio and I passed a couple of trail junctions and I felt that I knew where we were. I told him in my Sesame Street Spanish that we had "tres kilometers" to go to the checkpoint at Crescent. He took off running at that, but I was wrong. Soon I passed Rick Wagar, another runner, who had a GPS and informed me that we had six miles to go to the checkpoint. I should have said, "diez kilometers." Eventually we really did arrive at Wakemup hill and I was relieved to see it. I hobbled up to the top without taking a break (I had to take two breaks when I had biked) and then grimaced through the pain in my knee on the way back down. The trail wound it's way to the Crescent bar and last checkpoint. I had hoped to make it to the Crescent by 3AM so I could get something like a good night's sleep before sunrise, but it was now 5AM. I'd still be able to sleep, but not much more than a nap. Carles was warming up by the fire as I got in and he informed me that runner Scott Myers had measured -42 on the trail. I figured he must have his units wrong so I asked if he meant Fahrenheit or Celsius. "It doesn't matter," he said, "it's the same." And so it is. I ordered a pizza from the bar and ate the whole thing. I wanted more, but instead I laid down on the floor and right to sleep. Some time later I was nudged awake by one of the volunteers and told my hour was up. Apparently we were limited to only one hour of sleep in the Crescent checkpoint. I think it had only been about forty-five minutes, but I wasn't going to quibble. I was grateful to be warm and rested and I'm not sure I was really supposed to be sleeping on the floor anyway. As I left the eastern horizon was just beginning to lighten. John Taylor was coming in as I was leaving. He isn't fast, but keeps moving and doesn't sleep the whole time. Amazing, no wonder he sees such crazy stuff on the trail. Marcio and Rick passed me shortly thereafter and I was on my own for the last twenty miles or so. The long, straight, flat sections that typify the last miles of the Arrowhead Trail didn't seem to bother me. At least I was done with the hills. I got to the Cook turnoff and knew I had about 16 miles left to go. That felt good, but after thinking about it I still had at least 5 hours left on the trail and more like 7. Not such an encouraging thought. Still, I thought, there's nothing to do but keep walking. So I did. Eventually the day warmed up a little and I traded my down coat and army mitts for a fleece vest and lobster mitts. I usually only use the vest and lobster mitts in sub-zero temps, so I know it couldn't have been too warm. As I reached the last shelter it was time to deal with a problem that had been plaguing me for some time. I had been happily breaking wind since early in the race, but now by breaking wind I risked more than a minor stench in my shorts. Things were getting serious and I was expecting an outhouse at the shelter to deal with the problem. I was disappointed then that there was no such facility. I'd have to deal with this in the open. So I did. Now that I was almost done the "truckin'" theme started to come back to me. 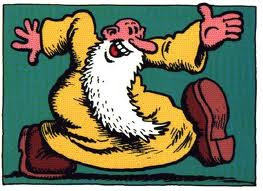 Now not only was I thinking of Mr. Natural, but the Grateful Dead song "Truckin'" was getting stuck in my head. I'm no deadhead, but it wasn't too bad a song to be stuck with. "What a long strange trip it's been," seemed pretty appropriate lyrics. I was tired and really slowing down. I was almost dragging my left leg down the trail and now I was using my poles like crutches much of the time. I wanted to bivy and sleep for a little while, but with the finish so close I wouldn't let myself. I arrived at the turnoff to the Casino and knew I was in the home stretch. I met Lisa Paulos, out for a walk, on the trail. I couldn't imagine just being out for a walk at that moment. Wasn't she tired from walking 70 miles? I was hurting a lot and no longer having any fun, but I was going to make it. I just kept truckin'. Finally there was the finish line and Arrowhead banner across the trail. Apparently someone had gotten word to the finish that I was coming in and Nick, Caitlin, and Matt Long were there to meet me. I finished in 56:01 and not a minute too soon. I nearly swore never to run a race again. I think I did say I wouldn't do the Arrowhead on foot again. Now, a week later, I am a little bit disappointed to have it behind me. It feels like it was too short. I wish it weren't over. Still, my leg is pretty messed up. I'm just now able to walk without a significant limp. I'm still in some pain though and having trouble sleeping because of it, but that'll get better. Next year? I think I'm going to ski. Matt, your amazing. I am in awe. An epic journey. Thank you for sharing. Amazing effort and write-up Matt. I had thoughts about footing the Arrowhead prior to the race, but now I'm not sure. Great job. Probably see you soon. Chippewa or Superior races this Spring?